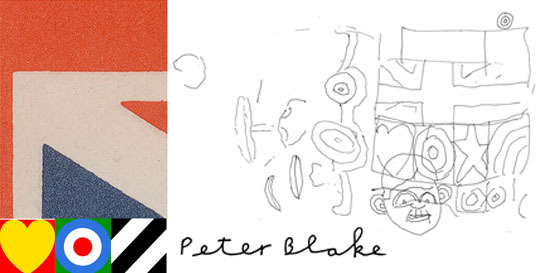 Next year's Brit Awards, which take place on February 21st at the O2 Arena, will see the winners presented with a trophy designed by Sir Peter Blake, the man responsible for the sleeve for The Beatles' Sgt. Pepper’s Lonely Hearts Club Band. Sir Peter Blake has spoken of his pride at being asked to design the trophy: “It is wonderful to be a part of this most important and exciting music event, honouring the greatest of talents shaping our musical landscape. I’ve enjoyed the creative challenge to honour such leading performers enormously,” he says. Brits organisers have also announced the return of James Corden as presenter for the third time, and second year in a row. 2011 saw a raft of changes that marked a new era for the legendary awards. Following this year's event the charts were dominated by Brit artists. In the official albums chart, seven of the Top 10 albums were either by Brit winners, performers or nominees. In the iTunes chart nine of the top 10 albums were BRIT winners or performers. Adele’s stunning rendition of Someone Like You became the most talked-about performance this year. Following the Brits the single climbed 46 places in the charts, reaching number one, where it spent five weeks in total. Like last year, the main focus of the awards will be on the all-new MasterCard British Album Of The Year Award. The night will showcase and highlight the incredible world-class albums released by British artists over the course of the year. This year's triumphant winner was Mumford & Sons for the critically acclaimed Sigh No More. Another significant change from previous years came by way of the Voting Academy, which, for the first time in the awards' history, invited artists to sit on the academy and cast votes. The Academy is made up of invited members from across the breadth of the UK music industry, from music critics to radio producers, music publishers, promoters, record companies, retailers and NUS representatives. With all 2011's winners and nominees being invited to join the panel for 2012, artists are now the single largest group represented.